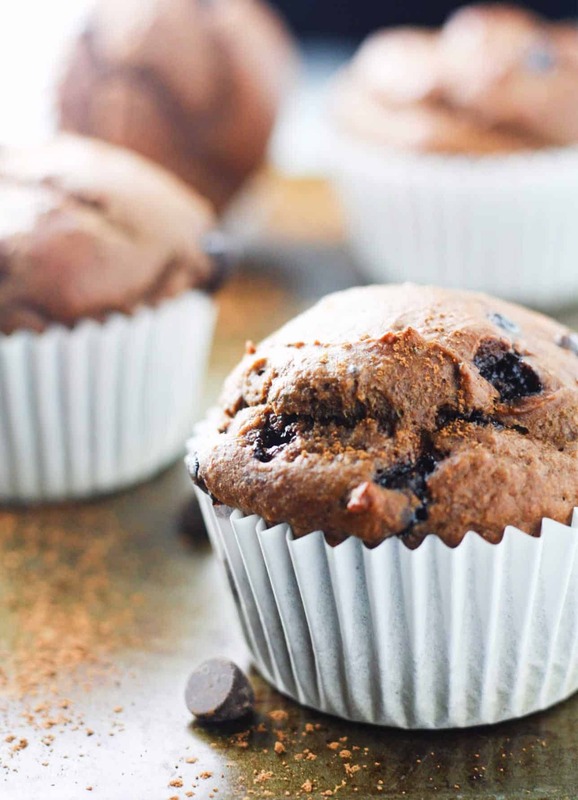 Double Chocolate Chip Protein Muffins that are loaded with hidden nutrients, high in protein, high in fiber and low in calories. Oh. My. These my dear friends, are the realio dealio. So for those of you that have been following my little baby blog for a while now, you would know that I have been oh so focused on calorie tracking as my main method of weight loss/maintenance. Since I began my healthy journey about two years ago, I’ve found that keeping in tune with the number of calories that I consume daily has been the saving grace to my waistline. The reason for this is because the concept is just so straightforward and well… it just works. For those of you that are totally new to the whole calorie counting concept, let me break it down for ya. The plan is to stick to a strict daily calorie budget based on your current weight. This budget will vary depending on how many pounds you plan to lose per week. For many, 1200-1500 calories per day is the ideal standard as it’s very maintainable, not overly restrictive and allows for a steady yet gradual weight loss. One of the best things about most of the calorie trackers on the market is that they will automatically calculate your daily calorie limit for you based on your provided height and weight. I gave both Lose It and MyFitnessPal a try and while I LOVED them both, I found MyFitnessPal to be a little more suited to my needs. SO. Now that you’re familiar with the whole calorie counting ordeal, it’s time do dive further into the deets. All in all, it took me about 3 months to reach my ideal weight – then came the weight maintenance. Oh the joys of maintaining that wonderful little number you worked so hard to achieve. All of which would have been INSANELY difficult without my two handly little helpers: protein and fiber. Finding foods that are not only low in calories, but high in both protein and fiber have been the key to my weight loss success. Both fiber and protein have the ability to give you that “full” feeling that helps tremendously to avoid over-eating and excessive snacking between meals. Sounds wonderful, I know. The only problem is that it can be hard to find a high protein, fiber rich food without paying the high calorie costs. This is why I’m SO HAPPY to share these Double Chocolate Chip Protein Muffins with you guys! 8g protein, 4g fiber ALL IN UNDER 200 CALORIES. *pinch*, you’re not dreaming. The secret to the high protein content is the fact that these muffins are l-o-a-d-e-d with hidden goods. We’re talking avocado, Greek yogurt, chia seeds to name a few. I also used a few scoops of chocolate protein powder. I happened to have the Premier Protein brand on hand, but any brand will work! Deliciously low calorie, high protein and high fiber muffins with a deliciously rich chocolate taste! Preheat oven to 375 degrees F. In a large mixing bowl, combine the flours, cocoa powder, nutmeg, cinnamon, salt, baking soda, chia seeds and protein powder. In a separate bowl, whisk together the vegetable oil spread with the brown sugar until light and fluffy. Add the avocado and whisk for another 30 seconds. Add the Greek yogurt, egg, vanilla extract and applesauce and continue to whisk until fully incorporated. Gradually add the wet ingredients to the bowl of dry ingredients, whisking until you achieve a smooth batter. Fold in the chocolate chips. Using a large spoon or ice cream scoop, divide the batter into cupcake liners lined in a muffin pan. The batter should make 16 muffins. Bake in the oven on the middle rack for 18-22 minutes or until a toothpick inserted into the center of a muffin comes out clean. Allow to cool and enjoy! Could you leave out the avacado in this receipe? These muffins look decadent and guilty, yet they are full of secrets! Secretly healthy ingredients and low count in calories!